More of a rock climb than a hike, this trail is unshaded and steep and difficult in places. Follow the basket cairns across the wash and up the moderate slope toward the spires. At 0.25 mile, the trail emerges on a broad ledge with nice views. Then, it ascends steeply over bald rock and in a shallow cleft with a few toeholds notched into the rock to help on the steeper places. Emerging on a small knob, cairns show the way up and across several ledges toward the deep drainage ahead which it follows, climbing moderately steeply to the top of a wide saddle between two spires. Great views all along, but quite spectacular from the top. An unmaintained path leads south along the west base of the spires giving access, with short climbs, to two more saddles between sheer rock faces and a close-up view of an exposed lava dike at the first. Return by the same route for a 1.5 mile hike. Hot in summer. Location: 38 miles south of Flagstaff in scenic Red Rock Country. Directions: From the junction of Routes 89A and 179, take 179 south 3.5 miles to Back O' Beyond Road on the right. Go 0.6 miles to the trailhead parking turnout on the left. 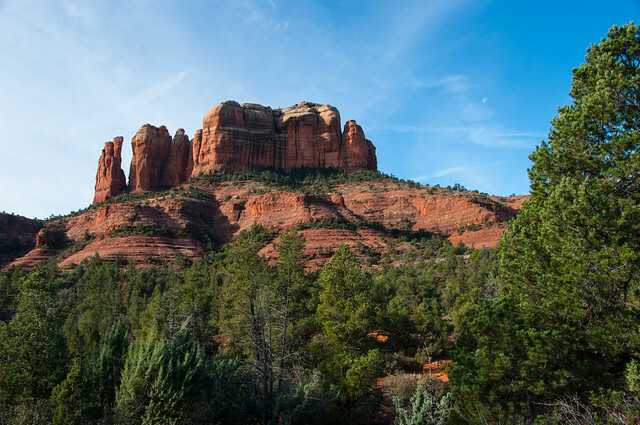 Red Rock Country Maps: Download Red Rock Country trail maps and find other Sedona recreation resources. See the Sedona Southeast [PDF] map for this trail system.